The Panasonic brand was initially created in 1955 as a manufacturer of audio speakers. The initial meaning was a combination of “Pan,” meaning all, and “Sonic,” meaning sound. Panasonic has since moved into many different products and services, manufacturing everything from televisions to phone software. For consumer electronics, Panasonic offers batteries and LED light bulbs in every shape and style currently available. 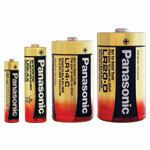 Whether you need AA, AAA, C, D or 9V batteries, Panasonic has them available.